On Friday 7 September, Day 2 of Valuing Landscape Conference 2018, Turkington Martin and conference sponsor Hardscape will lead an experiential site visit, ‘From the ground, up: exploring the fast-changing Greenwich Peninsula’. Here Asil Besim, Group Technical Manager at Hardscape, explains a little about what delegates can discover. It started with a dome. The development of the O2 arena marked a new beginning for the Greenwich Peninsula. Now the area has become a hotbed of cutting-edge architecture and design, progressive public realm and an emerging ‘new London’, which is set to shape the way people live, work and socialise for centuries to come. The project is an ever-evolving feat 20 years in the making, and the Greenwich Peninsula Riverside area is no exception. The project includes the development of seven residential plots as part of the second phase of the Riverside South masterplan, providing over 1,300 new apartments alongside a new community and leisure building. From a landscape perspective, Turkington Martin was responsible for the concept and detailed design of the communal gardens for each plot. The practice also designed the public realm infrastructure – creating a modern urban setting of shared streets, rain gardens and new social spaces for the emerging neighbourhood. 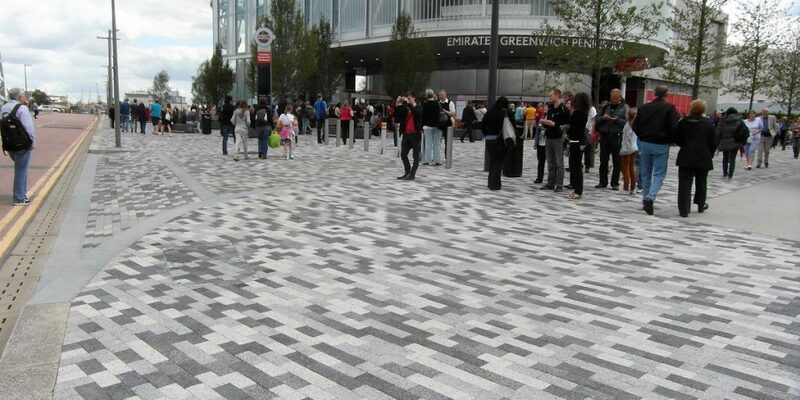 The public realm was delivered over a number of construction phases. Developing a design guide at the outset ensured a seamless composition on completion. 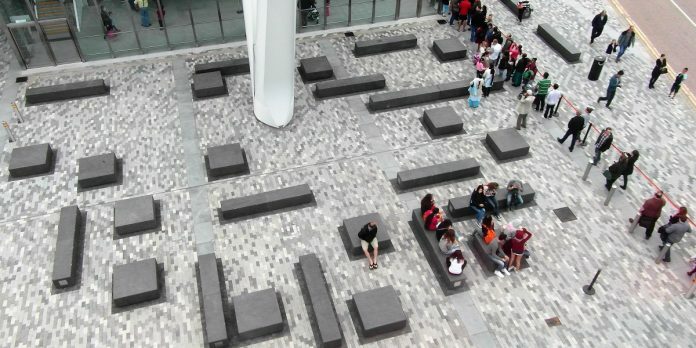 A restrained palette of paving materials was selected to provide a consistent design language, which enabled subtle variation, where required, to denote the hierarchy of streets, movement patterns and function. Acquired by developers Knight Dragon at a mid-way point, the long-term project took a new lease of life, as the goals and final vision shifted to become even more ambitious. This required all involved to embrace a new direction and realign all aspects of the design. Knight Dragon placed great importance on temporary uses as part of their placemaking strategy, as well as a good-quality permanent public realm that meets the needs of everyone at the Peninsula. It was a creative and enthusiastic approach that, according to Turkington Martin director Mike Martin, ‘required design collaboration with five architect practices, which we believe helped deliver a fully integrated and elegant solution across Greenwich Peninsula Riverside’. 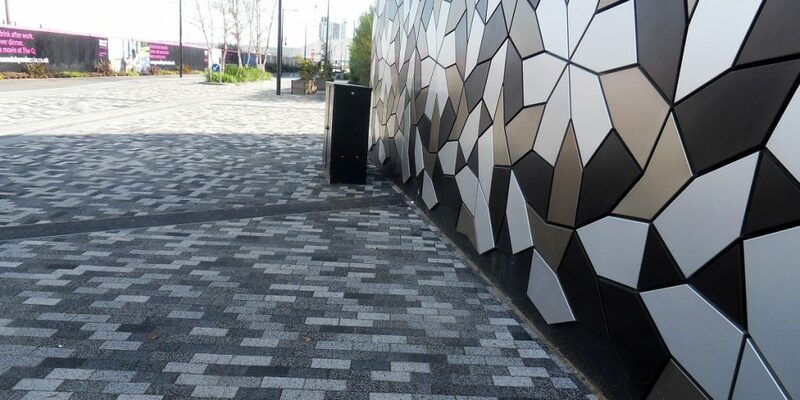 Having sourced and supplied hard landscaping materials for a number of cutting-edge projects within the Greenwich Peninsula vision, Hardscape’s team of specialists were well-equipped to overcome the complexities involved with projects of this size and scale. 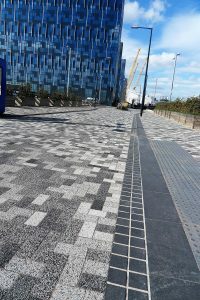 Our ongoing relationship with the Peninsula started more than ten years ago with the supply of Kellen, granite paving and kerbs to the area around the O2 arena. Since then, we have collaborated on a number of landmark projects – some complete, and some still to come to fruition. It is a fascinating development that is constantly evolving and responding to the needs of the growing community. We are proud to be playing a key role in bringing our expert knowledge in the supply of materials to such a landmark project which will make a lasting impact on London and beyond. And from a material perspective, it is so satisfying to see the flexibility of the Kellen product offer as the Peninsula grows and spans different uses. 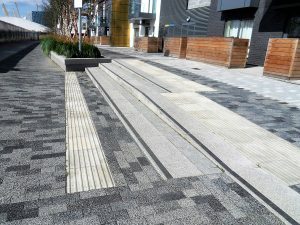 This week, Hardscape and landscape architects Turkington Martin invite you to discover the Greenwich Peninsula with a series of walking tours, as part of the LI conference, Valuing Landscape: Connecting People Place and Nature. Together, we will explore how landscape practitioners and suppliers can combine their skills to adapt and respond to evolving briefs, with a focus on the 5,000-home development at Greenwich Peninsula, home of the O2 and the Emirates Cable Car.